The land owned by Battelle in our neighborhood may look different in a few years. Battelle has informed the Harrison West Society that they plan to seek proposals for the development of their Harrison West property, which includes the parcels bounded by West 5th and West 3rd Avenues on the north and south and by Perry Street and the Olentangy River on the east and west as well as the parcels on the southeast corner of West 5th and Perry. Battelle would like to allocate funds from the sale of the land, which is used mainly for parking, storage and an on-campus day care service but also includes a green space well loved by the community, to make improvements to their core campus that will enable them to continue to attract top talent from an increasingly competitive market. The land is zoned C2 (Commercial 2) with a small portion on West 5th zoned for manufacturing. It is also zoned H35, which restricts building heights to 35 feet. Prior to Battelle’s purchase of the land, the area included homes and apartments along with neighborhood streets that extended to the Olentangy River. The day-care business, currently run by a third party not owned by Battelle, has two years left on its lease and has not renewed beyond that time period. Citing the vision set forth in the Harrison West plan, members of the Harrison West Society executive committee have recommended to city officials in the Departments of Development and Recreation and Parks that the parcels on the south end of the property at West 3rd and Perry be purchased and preserved as green space. Discussions about how to pay for the land have included a number of funding mechanisms including Gowdy Field money and one of the Humko TIFs. Additional revenue generated by development on the northern parcels would flow into the TIF and could help to fund the purchase as well, albeit retroactively. We will share more information as it becomes available. Stay tuned to the website and upcoming meetings for further developments. Columbus Business First summarized the developments in an article on July 17, 2015. We have one of the few single family homes on #rd Ave. and have been here 25 years. The green space is what attracted us here and it is still a major component of Harrison West that we like. 3rd Ave is already too busy and people drive too fast over the bridge as it is. With the further development of Grandview Yard, it will probably get worse. Let’s do all we can to save the green space please! People use it all of the time and it is very appreciated part of our community. As I think more about this project, it occurs to me that it would be really nice to see a development that is squarely focused on green features. What about solar power? What about permeable pavement to reduce runoff? What about roof-top gardens? What about rain catchment systems? I’m sure there are other green features that could really make this project unique and provide a direction for future development in the neighborhood and in the city. Battelle has always been respectful of our neighborhood and I trust that they will consider our input when deciding the future of the land. I’m sure the top talent they wish to attract will want to live in a beautiful, thriving neighborhood as we all know Harrison West is. This talent will consider the same things we all did when we moved here. Single family homes, easy access to the bike path, green space, beautiful trees, character, and low noise levels. If the trees and green space were to be destroyed and apartments and retail space built in their place, there would be a serious increase in traffic, noise, and zero green space. I wouldn’t want to live here. One of the big reasons I bought my house was because of the green space. Retail on Third Ave. would be the worst scenario. Please save the trees. As a local home-owner the tremendous influx of new development in Vic Village & surrounding areas is troubling. Congestion is becoming a serious issue especially on the already busy W 3rd Ave. Adding more development to this area would be a detriment to the neighborhood. 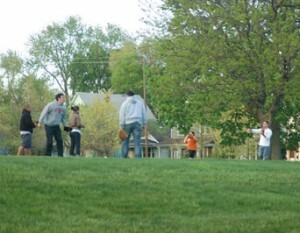 The current green space is utilized by the neighborhood year-round, myself included. I would hate to see this space become more cookie-cutter apartments/studios. There are plenty of those already with more being built. E Howat, Jane A, Jurga, S Barker, Matt Williams, I fully agree with your comments. The daycare is easily one of THE best in town & the Battelle employees who use it, love it. The community folks too. It is a tremendous asset to have in the neighborhood & for Battelle to attract employees. The Short North/Vic Vil/Harrison West area is getting ruined, in my opinion, by greedy developers who simple want to maximize the number of occupants they can squeeze onto existing lots without regard to parking, traffic flow, neighborhood character, neighborhood amenities, etc. I really hope this becomes an opportunity for positive change (retaining green space & the daycare) & not another giant apartment complex. All these ideas are swell, but what happens will be completely driven by the price that Battelle wants. If it is $1 million (it won’t be), you can have single family homes, Frisbees and dogs. If it is $20 million, you are getting multi-family and commercial. I would like to see the street grid restored if any development takes place where the parking lot is now. I, too, would like to see some green space preserved and would like to see owner-occupied homes – either single family or at most 1-4 family townhouses. WAY too much studio, 1BR rentals going on in this area. Also agree that traffic is becoming a major issue on Third and Fifth. Will only get worse as additional developments that are already in progress come on line. I agree with Matthew that it would be nice to see some retail/commercial but limited to Fifth Avenue. What would be very nice is some small little pockets for locals to walk to like we currently have on Third (Katalina, Café Apropos, Harrison’s, etc.) I don’t have children but know friends in the neighborhood whose children go to the daycare and it is a huge asset to attracting and retaining young families. The existing Bright Horizons daycare facility is one of the only childcare facilities available in our community and recently received accreditation from the National Association for the Education of Young Children. As a neighborhood home owner and young family of 4, the facility provides outstanding service in close proximity to both home and work. It would be tremendous loss to families in our neighborhood for it to close. I would like to see the green space left as is, the neighborhood comes out there to let the dogs socialize, fly a kite, play softball and so on. 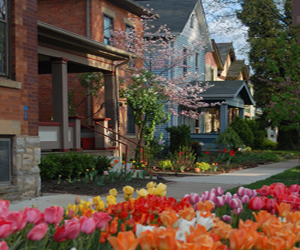 The green space is a great way for the neighborhood to continue to socialize. I agree with a lot of the residents speaking out and would also like to see the parking lot along Perry St to be single family homes, we have apartments coming up all over the neighborhood which is getting the neighborhood very congested with traffic, parking and so on. Single family homes seem to bring the neighborhood together which keeps it clean and cared for. I would like to see some small shops along 5th ave. Coffee shop, spa, some office space would work great at that location.Harrison West has a high number of pedestrians, but just to get a good cup of coffee we have to walk all the way to short north. I am definitely against any large building in the are as I would prefer to live in the neighborhood near the city rather than in the city. PLEASE NO NEW development. Third Ave cannot handle any more traffic thanks to Grandview Yard. The roads already take a beating with the construction traffic (Michigan) and the delivery trucks that speed through the neighborhood. Save the Third and Perry green space! It’s the only respite in the neighborhood where you can breathe. If we become any more dense (like we need more apartments? condos?) you might as well start calling us Little Manhattan. I’d like to keep the green space as well and see it remain a largely open field for people to be able to play frisbee or pickup football or (quidditch). It would be nice to expand the buffer along the river, too, but not at the expense of the open field. As far as development, my preference would be for single-family homes with retail/commercial limited to the W. 5th Ave. corridor. I wouldn’t want to see such development hurt our W. 3rd Ave. corridor, though, so I’d like to see it have a different focus. I could live with multi-unit housing if it were to be owner-occupied in accordance with the neighborhood wishes expressed in the Harrison West Plan. I would not be pleased to see more rental; our neighborhood already has too much rental that’s not properly maintained by absentee landlords. I wouldn’t mind seeing mid-rise buildings along W. 5th–4 or 5 stories. While I wouldn’t object to a Joseph-style boutique hotel, I would be less pleased to see an extended-stay property. I think it would be great if the developer restored the street grid. I agree the green space is important. I would like to include in this study/discussion a view of all the housing that is currently being built. It appears as if there is a lot of multifamily properties being built in Harrison West, Short North and soon to be developed in Grandview Yard. Why not Single Family homes? Neighbors speak up. What do we want to see in our neighborhood? I would like to see the current green space kept as an open field for future generations to enjoy. Keeping Harrison West a great place to live work and especially play.